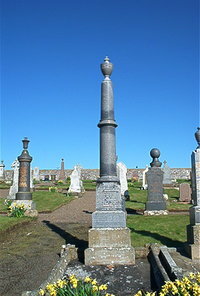 John Macgregor crofter of Leodibest died 9th November 1912 aged 90. Son James Macgregor died at Brisbane 7th April 1920 aged 40. Wife Christina Munro died at Leodibest 13th October 1923 aged 86. Daughter Isabella Macgregor died at Port Mackay Queensland 8th August 1902 aged 33 wife of John Green. Son Charles Macgregor died in Queensland 4th November 1935 aged 67. Son William Macgregor died at Glenorchy Queensland 9th March 1937 aged 70. Daughter Jessie Macgregor died 5th January 1955 aged 81.